With the construction of new homes in Australia, pigeons are being displaced from demolished buildings. We are now finding that feral pigeons are becoming more and more of an issue in residential areas. Once pigeons have set up home on your roof, they can be quite stubborn to move. They will breed rapidly and with in a few short years one pair can turn into 20 or 30 birds. 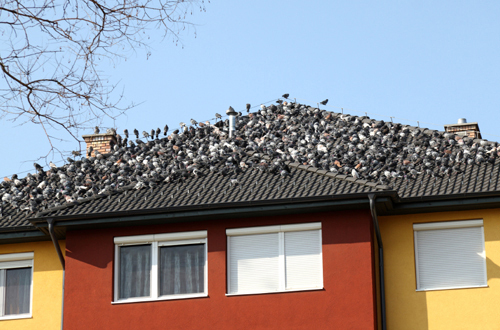 The biggest issue that people face is that once a pigeon has been born on a particular roof or structure they will continue to return to this roosting point every night. You can try some products on the market to scare or irritate the birds, however in most cases you will find that the pigeons simply get use to these. In these cases the only real choice is to remove the pigeons from the roosting site. This can be done by a variety of ways from trapping the birds to culling the birds by shooting. We have licensed and fully trained pest technicians within Jim’s Pest Control who can offer you an effective solution to your pigeon problems.